The DTK-120SR ‘Critical Load’ surge protector from DITEK is a true multi-stage series hybrid design which provides the best filtering and lowest clamp levels in its class. Designed for critical 120V circuits, it meets both government and military specs for fire panel applications. A user replaceable fuse means less down time and longer service life. 120V, 20A series connected surge protector. 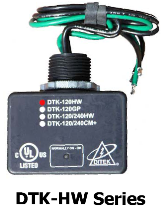 DITEK 120/240CM+ is a durable, cost-effective Surge Protective Device (SPD) suitable for use in a variety of locations. The CM+ is typically used to protect pumps, motors, HVAC condensers and incoming utility power. Backed by our ten year warranty, the 120/240CM+ is an excellent choice for effective, economical surge protection. 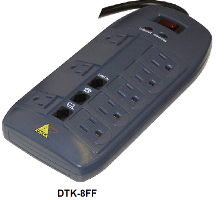 DITEK DTK-8FF eight outlet SPD (Surge Protective Device) protects AC power and telco/modem/fax lines. Hybrid circuitry provides excellent point of use protection. Up to six transformers, or four transformer and four standard plugs, can be protected at the same time. EMI/RFI filtering provides extra protection for sensitive electronics. 8 outlet plug-in AC surge protector with phone/fax/modem protection and EMI filtering. 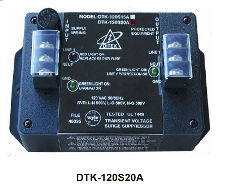 The DTK-120S20A 'Critical Load' surge protector from DITEK is a true multi-stage series hybrid design which provides the best filtering and lowest clamp levels in its class.Designed for critical 120V circuits, it meets both government and military specs for fire panel applications.A user replaceable fuse means less down time and longer service life. 120V, 20A series connected surge protector. 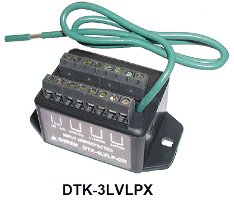 DITEK 3LVLPX is designed to protect Wiegand card readers. 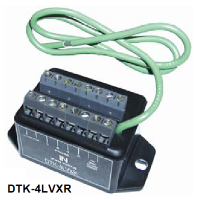 Its three terminal pairs protect all the 12V-14V standard Wiegand reader connections in one compact unit. 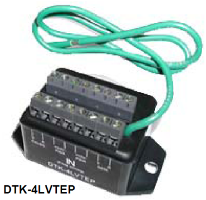 DITEK 4LVLPCR is designed specifically to protect the various circuits that supply card readers. 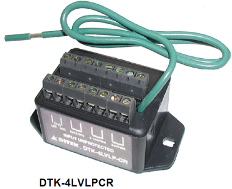 The 4LVLPCR protects both 12-24V power circuits, and 5V data circuits, in one compact package. Commercial access control surge protector. DITEK PVP27C protects all the sensitive feeds to Pan-Tilt-Zoom cameras, not just the video cable. Simple to install, the PVP27C protects 24 Volt power conductors and coaxial conductors in one compact package. With the lowest video let through voltage (and best surge protection) on the market, the PVP27C provides ideal surge protection for sensitive, high-quality Coaxitron PTZ cameras. DITEK PVP27B protects all the sensitive feeds to fixed cameras, not just the video cable. Simple to install, the PVP27B protects 24 Volt power conductors and coaxial conductors in one compact package. With the lowest video let through voltage (and best surge protection) on the market, the PVP27B provides ideal surge protection for today’s sensitive, high-quality fixed cameras. Models are available to protect BNC, Coaxitron (PTZ), and Twisted Pair video. 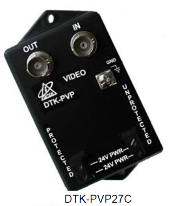 DITEK PVP27BTPV protects all the sensitive feeds to fixed cameras, not just the video cable. Simple to install, the PVP27BTPV protects 24 Volt power conductors and coaxial conductors in one compact package. With the lowest video let through voltage (and best surge protection) on the market, the PVP27BTPV provides ideal surge protection for today’s sensitive, high-quality fixed cameras. Models are also available to protect BNC and Coaxitron video. DITEK DP4P protects all the sensitive feeds to critical Pan/Tilt/Zoom cameras, not just the video cable. Simple to install, the DP4P protects 24 Volt power conductors, 5 Volt RS-422 data pairs, and coaxial conductors – all in one compact package. With the lowest video let through voltage (and best surge protection) on the market, the DP4P provides ideal surge protection for today’s sensitive, sophisticated PTZ cameras. Models are available to protect BNC Coax, Balun, and Twisted Pair video. 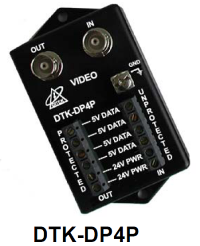 DITEK DP4P protects all the sensitive feeds to critical Balun connected Pan/Tilt/Zoom cameras, not just the video cable. Simple to install, the DP4P protects 24 Volt power conductors, 5 Volt RS-422 data pairs, and Balun UTP & coaxial conductors – all in one compact package. 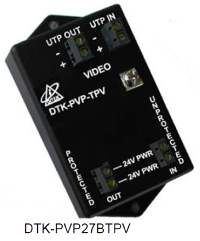 With the lowest video let through voltage (and best surge protection) on the market, the DP4P provides ideal surge protection for today’s sensitive, sophisticated PTZ cameras. Models are also available to protect BNC Coax and Twisted Pair video. 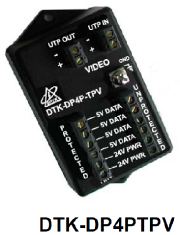 DITEK DP4PTPV protects all the sensitive feeds to critical Pan/Tilt/Zoom cameras, not just the video connection. Simple to install, the DP4P protects 24 Volt power conductors, 5 Volt RS-422 data pairs, and twisted pair video conductors – all in one compact package. 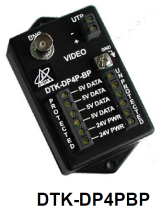 With the lowest video let through voltage (and best surge protection) on the market, the DP4P provides ideal surge protection for today’s sensitive, sophisticated PTZ cameras. 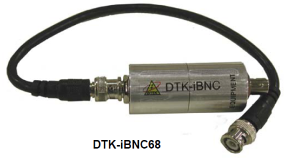 Models are also available to protect BNC Coax, and Balun video. DITEK inline coaxial surge protectors are designed for applications where a dedicated ground is impossible or impractical. Since there is no external ground, the iBNC protects video feeds without introducing ground loops. Fast and easy installation and solid performance make these a favorite of professional CCTV systems integrators. Fixed or Coaxitron PTX camera surge protector. Fixed camera protection: DTK-iBNC2.8 (2.8V video clamping). Coaxitron (PTZ) camera protection: DTK-iBNC6.8 (6.8V clamping).